Healthy eating never tasted so good! Join the zucchini noodle craze (zoodles) with my Honey Lemon Ginger Chicken Zucchini Noodle Bowl. A perfect balance of flavors between sweet and tart with the honey lemon ginger glaze. I don’t know why it’s taken me so long to get on the zoodle train. I really like zucchini and eat it a lot. We even grew it in our garden this year. Zucchini is an easy vegetable to incorporate into lots of dishes. It’s super versatile and can even be used in bread, muffins, and desserts. I knew I wanted to try zucchini noodles, but not with a tomato sauce like spaghetti. That’s when I thought about using the zoodles in an Asian style dish. My favorite type of Asian dishes is always on the citrus and sweet side (orange chicken, lemon chicken, sesame chicken). 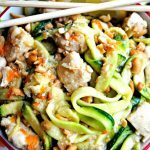 I knew that the flavors of honey lemon ginger chicken would be perfect for the taste and texture of the zucchini noodles. I have the Oster Electric Spiralizer which comes with two sized blades, one for spaghetti and one for fettuccine sized noodles. I used the fettuccine sized blade for this recipe. I wanted the zucchini noodles to be similar to Lo Mein noodles. My spiralizer is super easy to use, and I am looking forward to trying it with other vegetables, especially sweet potatoes. 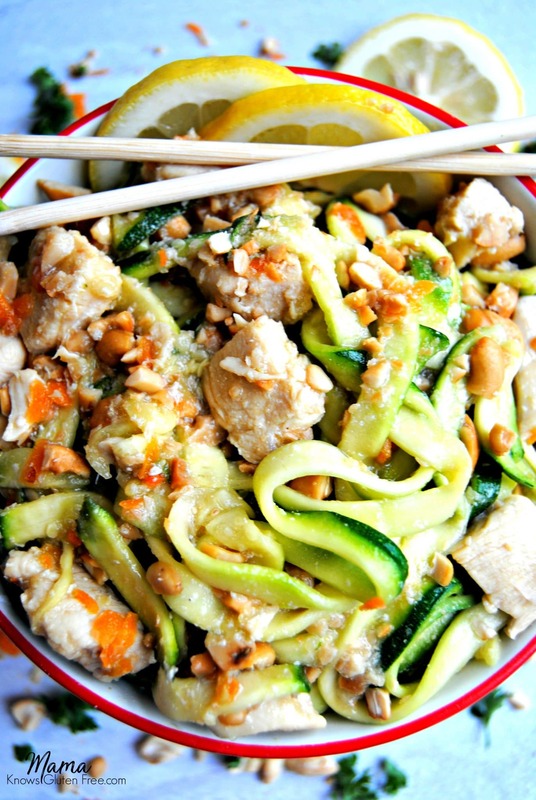 Zucchini noodles are a perfect grain-free alternative to pasta, making this dish not only gluten-free but also Paleo. I was so surprised at how much my family enjoyed them. My kids even like them! 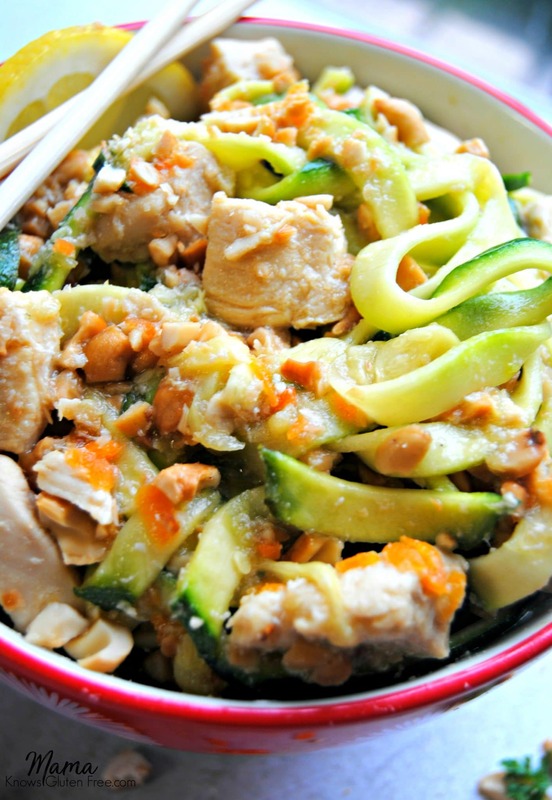 The honey lemon ginger chicken is so light and refreshing when tossed with the zucchini noodles. This meal is healthy, super easy and is ready in thirty minutes. It’s an easy Paleo recipe that everyone will love. (Paleo just means gluten-free, dairy-free and grain-free). This dish is so full of flavor – just because you are eating healthy you won’t have to compromise on taste! Looking for more Paleo dinner recipes? Check out these gluten-free dinner recipes. Place zoodles in a colander and salt liberally (don't skip this step) let sit for 20 minutes and then soak up extra moisture with a paper towel. In a medium saucepan, add 1 teaspoon of sesame oil, minced garlic and ginger. Sauté over medium heat for 2-3 minutes. Add honey, lemon juice, lemon zest, apple cider vinegar, gluten-free soy sauce and gluten-free cornstarch stir to fully combine. Bring to a boil and reduce to a simmer. Let simmer and thicken while cooking chicken. Cut the chicken into bite sized pieces and add to a medium skillet with 1 teaspoon of sesame oil. Add the shredded carrots and chopped cashews. Sauté the chicken for about 4-5 minutes until lightly browned and no longer has pink in centers. Add the sauce to the chicken and toss to coat. Squeeze out excess water from the zoodles with a paper towel. Add zoodles to the pan with the chicken and sauce and sauté for 3-5 minutes. Garnish with chopped cashews and lemon wedge/wheel. This recipe is so good! Not only did I throughly enjoy it, I knew my family was going to love it so much, that I actually made another batch before they got home so that they wouldn’t have to fight over it. My husband did a happy dance and said this was soooo good that it had immediately become one of his top three recipes that I have made. Highly recommend!! Wow! 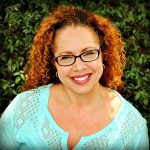 Thank you so much Tricia for the wonderful 5-star recipe review. I can’t tell you how happy it makes me to hear that your family enjoyed the Honey Lemon Chicken. You made my night! Thank you again!